The Bay Citizen, Citizen of Tomorrow Award. 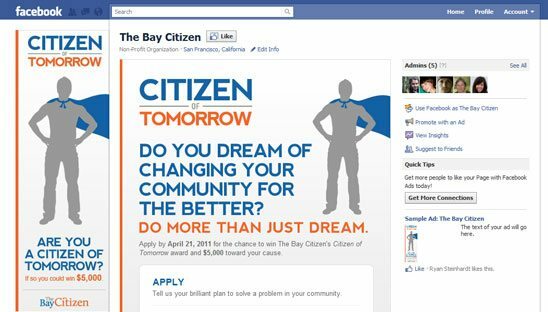 Are you a Citizen of Tomorrow? Apply now for your chance to win $5000, media coverage for your cause, and invitations to our award ceremony. This is a 2 part project. We have just finished the 1st part, which consist of Logo & branding, a custom facebook design which gives the overall brief of the Citizen of Tomorrow, which then links to the wordpress site we designed. The wordpress site has a few pages with details, rules and the Entry form (created using cforms), then the wordpress site was imported into an iFrame on the Bay Citizen main site. Check back next month to see stage 2.